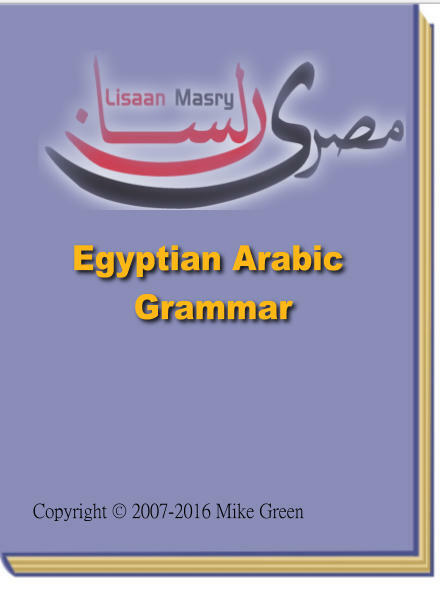 This document is a concise reference to grammar for people who are learning the spoken Arabic of Egypt. It is intended to be used alongside other study aids available free of charge at www.lisaanmasry.com. It is not difficult to learn to read and write in Arabic, but it is an additional barrier to learning. but it is by no means essential. The examples in this document are therefore written in both Arabic and roman letters. There are two ways of writing Arabic using roman letters: the transliterated form tells you exactly how it would be written in Arabic, and the pronounced form gives you an indication of how to pronounce it in European letters. For the pronounced form, I have chosen to write things how and English person would. My apologies to people whose first language is not English. The examples in the PDF version are this document are written in Arabic and in pronounced form. This material is Copyright © 2007-2012 Mike Green.